Increasingly, crowdsourcing provides valuable hydrologic data for research and watershed management. Many of us regularly rely on crowdsourced mobile phone data for traffic conditions, restaurant reviews, and recommended news articles. Environmental scientists use crowdsourcing to map biodiversity, invasive species, phenology, and bird locations [Tweedle et al., 2012]. Increasingly, crowdsourcing is also providing valuable hydrologic data for both research and watershed management [Turner and Richter, 2011; Lowry and Fienen, 2013; Little et al., 2016]. Keeping an eye on the world’s streams is a daunting task. If you added up the length of all the streams around the world, the total would be at least 89 million kilometers [Downing et al., 2012]. Even in regions with good hydrologic monitoring networks, it is unrealistic to monitor all streams with in-stream sensors. Crowdsourcing is a practical method to increase the accuracy of stream maps and expand understanding of when, where, and how streams flow. Not only do the world’s streams span an immense spatial extent, but many of them require frequent checking to catch them in action. More than half of the global stream channel network is likely intermittent (i.e., the streams do not have flow year-round [Datry et al., 2014]), yet most streamflow monitoring stations are located on perennial streams. In dry regions, almost all streams are intermittent, but even humid regions have intermittent headwater streams. These streams provide surface water supply, groundwater recharge, nutrient storage and cycling, habitats for aquatic and terrestrial wildlife, and support for vegetation communities that stabilize stream banks [Levick et al., 2008]. Existing map layers often classify stream types incorrectly [Fritz et al., 2013], so many areas lack accurate information on intermittent stream locations. The CrowdWater project’s goal is to improve hydrologic forecasts with the help of crowdsourced data that include water level, streamflow, soil moisture, and the flow condition of intermittent streams. This project, which is funded by the Swiss National Science Foundation, also assesses the accuracy of the data, the effectiveness of quality control measures, and how useful citizen science data are to calibrate or improve hydrologic models. The CrowdWater project uses an approach that is similar to geocaching. CrowdWater data are collected with an app developed by Spotteron, a citizen science app development company based in Vienna, Austria, on behalf of the University of Zurich. The app has been available for Android and iOS since April 2017 and can be used free of charge. The CrowdWater project uses an approach that is similar to geocaching: Every participant can establish a new station and contribute data for already existing stations. No physical installations or sensors are needed for the measurements. For stream-level measurements, the user takes a picture and uses the app to add a virtual staff gauge to the picture. When that person or another user returns to the site at another time, the user can determine the new water level by comparing the current water level to the virtual staff gauge on the picture. The status of intermittent streams can be recorded using six categories: flowing water, standing water, connected pools, isolated pools, wet streambed, and dry streambed. Measurements for streams that are not on the map help to document the existence of the intermittent stream network. For soil moisture, another qualitative scale (based on the work of Rinderer et al. ) is used. So far, almost 400 CrowdWater stations have been established, and 121 different participants have made more than 1,000 measurements. Everyone can participate, and all participants in the project can view and request the data. Participants can see a time series of the data collected at each site when they enter new data in the field, and they can use the data to monitor their environment or to plan kayak outings or fishing trips. The project organizers will also use the data to test their usefulness for hydrologic model calibration and for improving understanding of streamflow dynamics. The long-term goal is to be able to obtain crowdsourced data in countries that have little hydrometric data or to supplement the available data. 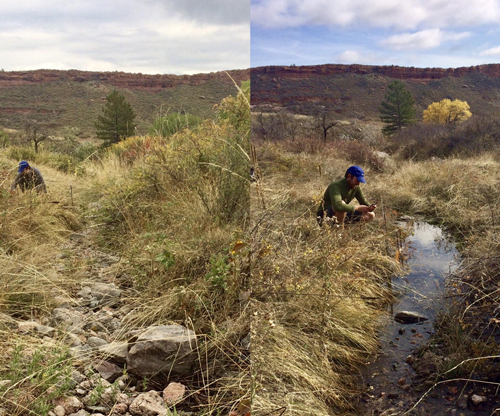 Stream Tracker focuses on documenting flow patterns in intermittent streams. Stream Tracker focuses on documenting flow patterns in intermittent streams. This project started in April 2017 with funding from the Citizen Science for Earth Systems Program of NASA. Stream Tracker’s goal is to improve intermittent stream mapping and monitoring using satellite and aircraft remote sensing, in-stream sensors, and crowdsourced observations of streamflow presence and absence. The crowdsourcing component is critical for understanding intermittent streams because remote sensing provides data infrequently, and widespread sensor installation is infeasible. 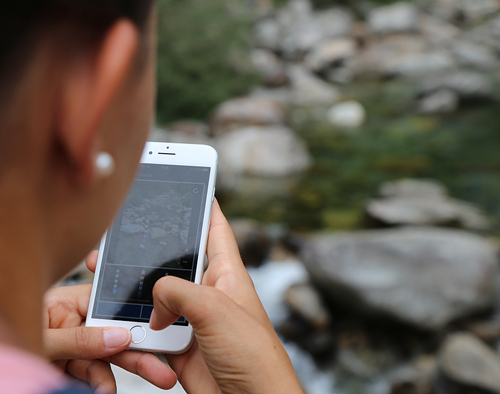 Crowdsourcing can fill in information on streamflow intermittence anywhere people regularly visit streams—during a hike or bike ride or when passing by while commuting. Stream Tracker sites can be established on any stream through the project website on the citizen science platform CitSci.org. Ideal sites are streams that do not flow continuously, are publicly accessible, and have an evident channel that will be easy to see even when the stream is not flowing. Anyone can join the project, establish sites in locations of interest, and track the streams over time. Current participants range in age from elementary school students to retired teachers and include not only stream experts but also people who have never monitored streams before. Project members can navigate to the sites using mobile phones or GPS units and can enter data on whether the stream is flowing through the free CitSci.org mobile app. For researchers who regularly visit field sites, stream tracking is an easy add-on to a field day. Researchers can identify stream crossings on their route to field sites, add these locations as monitoring points on Stream Tracker, and upload data after each field visit. All Stream Tracker data are freely accessible through the project website. Why Are Crowdsourced Hydrologic Data Useful? Crowdsourcing projects in hydrology can vastly increase the number of monitored tributaries in a watershed. Crowdsourcing projects in hydrology can vastly increase the number of monitored tributaries in a watershed. For example, over its first year of measurements in the Cache la Poudre basin of northern Colorado, Stream Tracker has revealed which parts of the watershed contributed snowmelt or rainfall runoff to the main river channel at different times of the year, helped improve maps of stream types, and documented habitat conditions for species relying on intermittent streams. As streams change with climate, land use, water use, and other stressors, crowdsourced data can help reveal when, where, and how these changes affect flow. Crowdsourcing hydrologic data is also an easy means to promote public engagement and education about streams and watershed processes. As these and other hydrology-related citizen science projects develop, we will continue to work toward creating accessible tools suited for a wide variety of locations and applications. We welcome any input from others interested in crowdsourcing hydrologic data. You do not need to be a hydrologist to be able to contribute to these projects. It is easy and accessible, and anyone can participate. So get outside and track some streams! To learn more, share your own streamflow observations, or get involved, visit our websites for CrowdWater and Stream Tracker. CrowdWater is funded by the Swiss National Science Foundation (project 163008). Stream Tracker is funded by NASA award NNX17AF96A. We thank all of the CrowdWater and Stream Tracker participants who have contributed to the networks so far. Datry, T., S. T. Larned, and K. Tockner (2014), Intermittent rivers: A challenge for freshwater ecology, BioScience, 64, 229–235, https://doi.org/10.1093/biosci/bit027. Downing, J. A., et al. (2012), Global abundance and size distribution of streams and rivers, Inland Waters, 2(4), 229–236, https://doi.org/10.5268/IW-2.4.502. Fritz, K. M., et al. (2013), Comparing the extent and permanence of headwater streams from two field surveys to values from hydrographic databases and maps, J. Am. Water Resour. Assoc., 49, 867–882, https://doi.org/10.1111/jawr.12040. Levick, L., et al. (2008), The ecological and hydrological significance of ephemeral and intermittent streams in the arid and semi-arid American Southwest, Rep. EPA/600/R-08/134, 116 pp., U.S. Environ. Prot. Agency, Washington, D. C.
Little, K. E., M. Hayashi, and S. Liang (2016), Community-based groundwater monitoring network using a citizen-science approach, Groundwater, 54, 317–324, https://doi.org/10.1111/gwat.12336. Lowry, C. S., and M. N. Fienen (2013), CrowdHydrology: Crowdsourcing hydrologic data and engaging citizen scientists, Groundwater, 51, 151–156, https://doi.org/10.1111/j.1745-6584.2012.00956.x. Rinderer, M., et al. (2012), Sensing with boots and trousers—Qualitative field observations of shallow soil moisture patterns, Hydrol. Processes, 26, 4,112–4,120, https://doi.org/10.1002/hyp.9531. Turner, D., and H. Richter (2011), Wet/dry mapping: Using citizen scientists to monitor the extent of perennial surface flow in dryland regions, Environ. Manage., 47, 497–505, https://doi.org/10.1007/s00267-010-9607-y. Tweedle, J., et al. (2012), Guide to Citizen Science: Developing, Implementing and Evaluating Citizen Science to Study Biodiversity and the Environment in the UK, Natural History Museum, London. 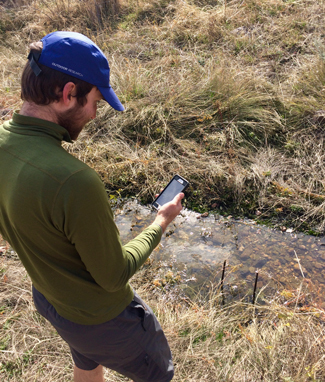 Citation: Kampf, S., B. Strobl, J. Hammond, A. Anenberg, S. Etter, C. Martin, K. Puntenney-Desmond, J. Seibert, and I. van Meerveld (2018), Testing the waters: Mobile apps for crowdsourced streamflow data, Eos, 99, https://doi.org/10.1029/2018EO096355. Published on 12 April 2018.